Pave' was named for the treacherous farm roads used in the spring Classic bike races in Belgium and France. The roads are made of real cobblestones (Pave') which become "Like Ice" when wet. Riders who can master the stones are revered in cycling lore. 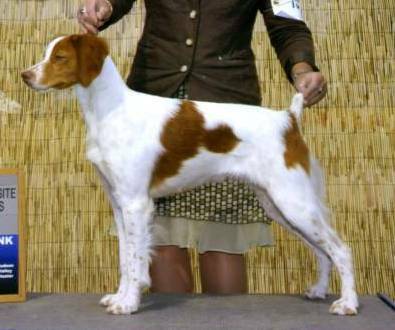 Aptly named, Pave' is beautiful and challenging and proof that finesse and patience can be required with a Brittany! Pave' is also a fierce cover dog and naturally retrieves to hand. Pave' was never ran in the field as a puppy due to our time constraints. 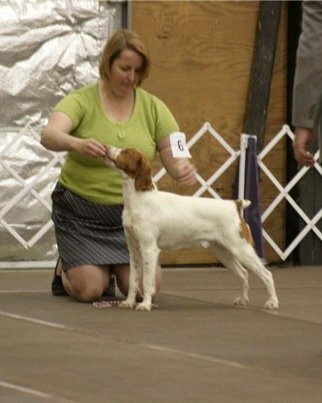 However she quickly amassed 8 derby placements and her points, mostly against pointers and setters. 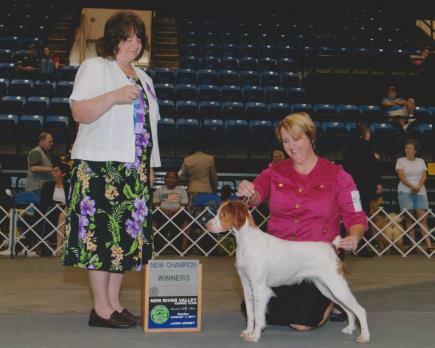 Pave' came back to the show ring after her litter of puppies and rolled through her Grand Championship in style, finishing in 7 shows including BOS at the Tidewater Brittany Club Speciality.